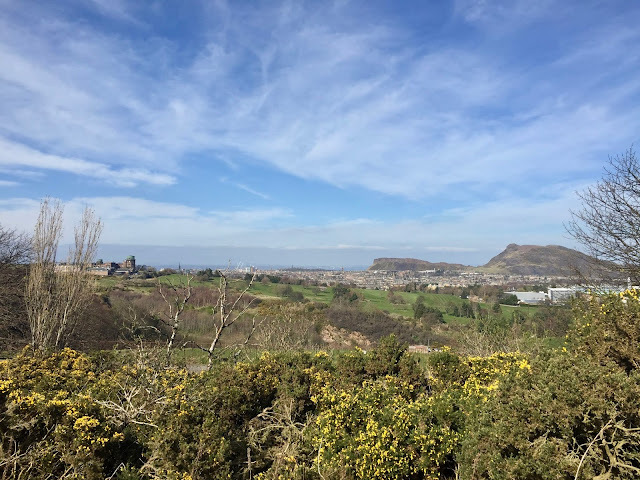 Spring started to appear in Edinburgh last week, all blue skies and sunshine, and temperatures in the double digits - though it was swiftly replaced by grey clouds, pouring rain, and freezing cold again this week, with what feels like our third winter this year! Before that happened though, I seized a sunny afternoon to do some more hiking. 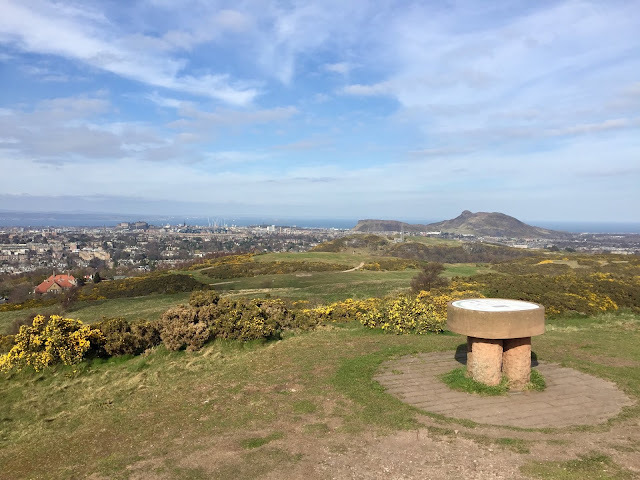 I've conquered five of Edinburgh's traditional 'Seven Hills' (some of these are actually made of more than one), which I'll link at the end of this, so I went for number six, the Braid Hills. The Braid Hills are located to the south of the city, just a bit further behind Blackford Hill and the Hermitage of Braid woods. It's a half hour walk or so from town to get to the starting point of the hike, or you can take a bus to Braid Hills Road. 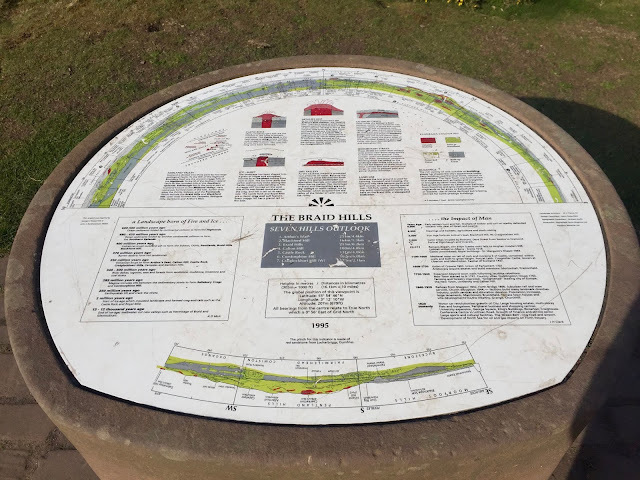 The walk itself takes about an hour to an hour and a half, and is a circular loop around the hill. 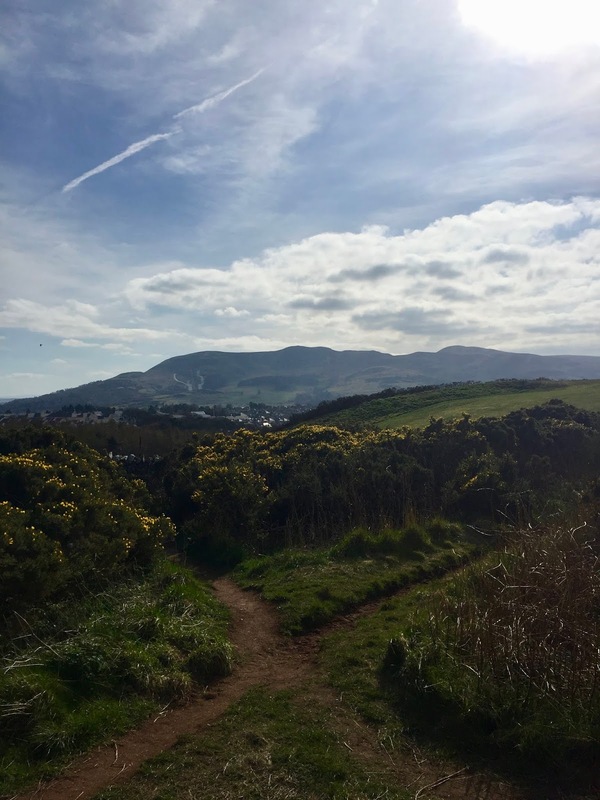 There's not much of an incline, as the route is level the whole way around, and you've already done the uphill part just getting to the start of the route. 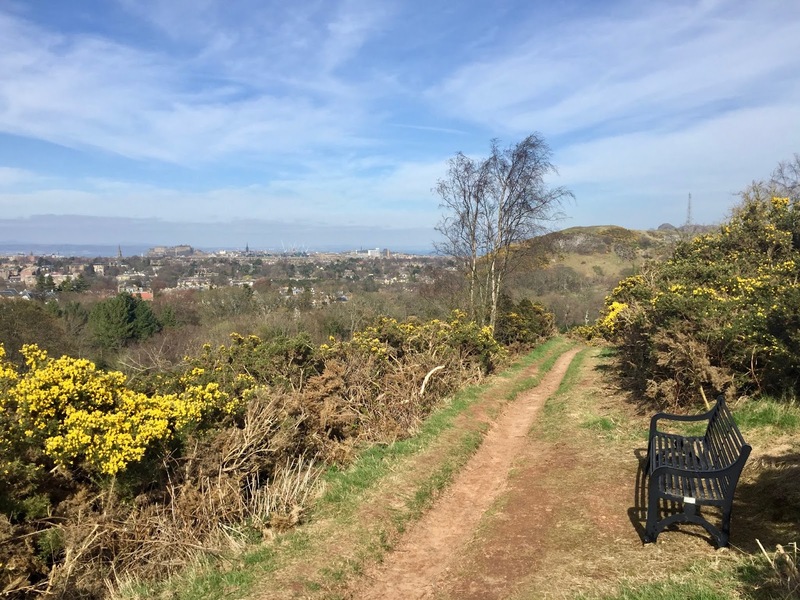 Much of the centre of Braid Hills is taken up by golf courses, so the path goes around them. 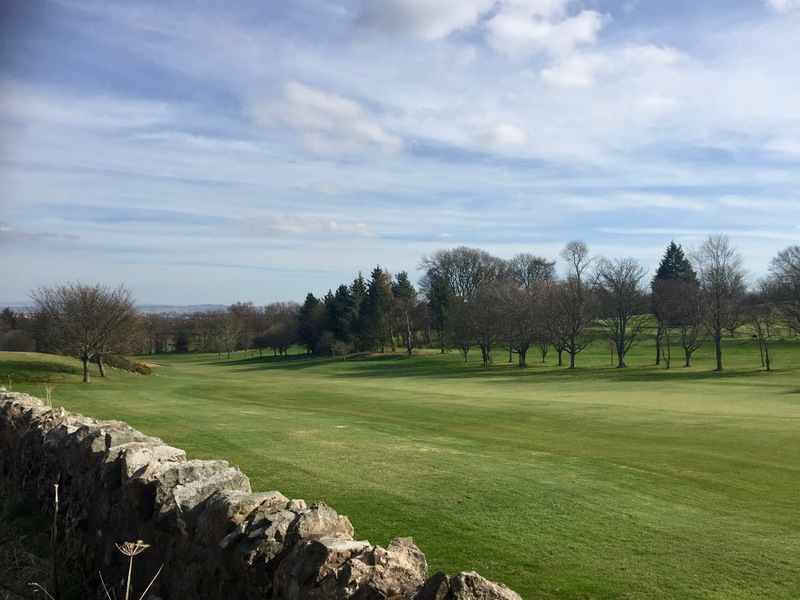 You can actually join it at the east or west side of the hills, where there are golf clubs, and I did the latter, purely being closer to home for me. I did the walk on a weekday, so I only encountered about a dozen other people along the way. 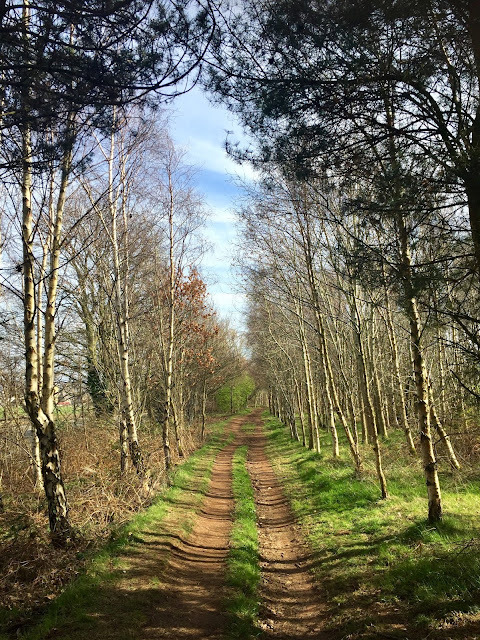 I was following the path clockwise, firstly through patches of thick gorse bushes, yellow flowers blooming for spring. The path soon comes close to the road, the two running parallel along the hillside, which is less than ideal when I normally hike to get away from city life, but it's not a very busy road really. 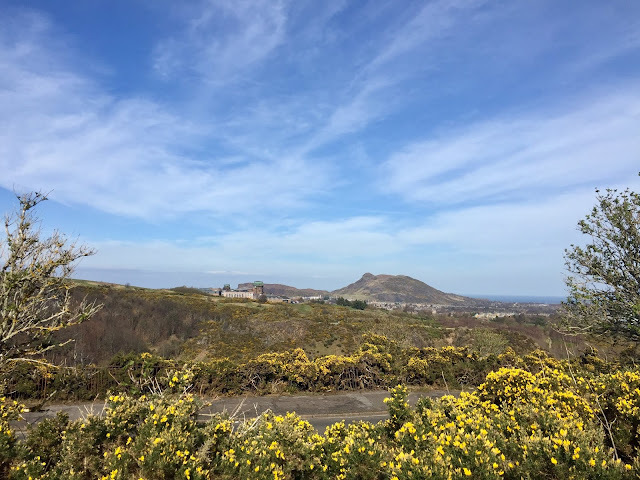 The gorse bushes also opened up to views north over the city, including Castle Rock (with Edinburgh Castle), Blackford Hill (with the Royal Observatory), Calton Hill, and Arthur's Seat - four out of the other seven hills! I ambled along peacefully, even removing a layer of clothing under the warm sun. The golf course soon appeared on my right, though I seemed pretty safe from any potential flying balls, with no one else in sight. I continued on, spotting North Berwick Law in the distance, visible on such a clear day, before trees sprung up on either side of the path. This distanced me from the road, which was a relief. After forty minutes or so since starting, I reached the other golf club, on the east side, and the path started to curve south, and then back to the west. 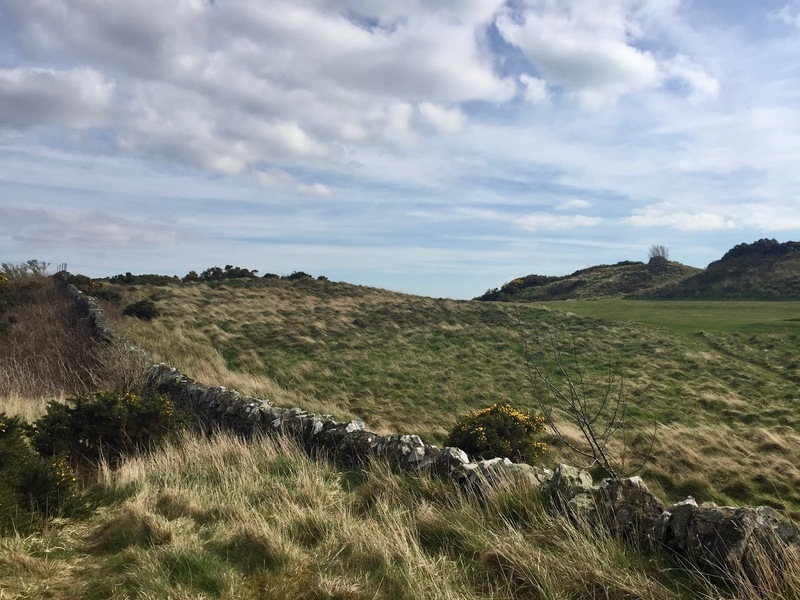 There were drystone walls separating the golf course and hiking path from open fields beyond them. 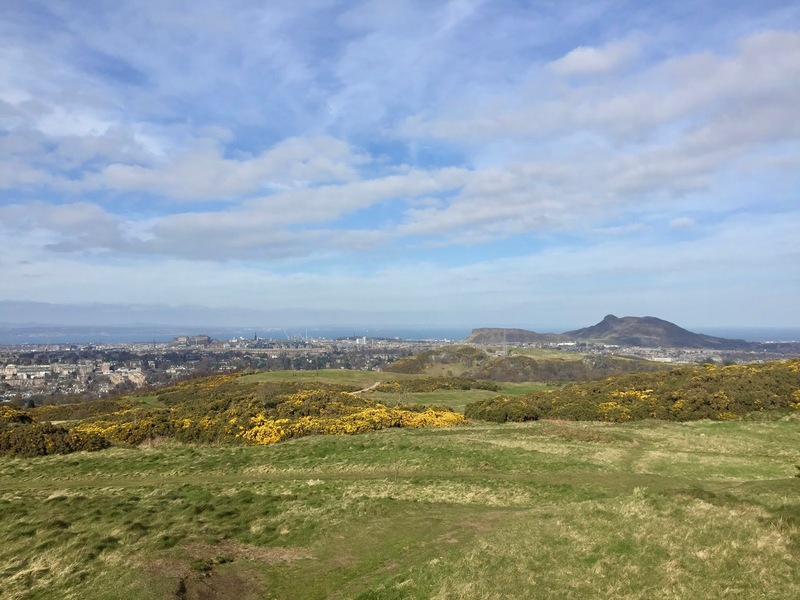 With my back to the city view now, it almost felt like I was out in the countryside and farmland, not still in the middle of Edinburgh! I seemed to encounter a few more dog walkers and joggers at this point than I had up until now as well. As the path took me back west again, I was surrounded by hills, trees, and endless green, with the roads and the city out of sight again. There was a slight incline at this point, compared to the very level ground so far, but it was still minimal and very easy, certainly compared to some of the other hills. 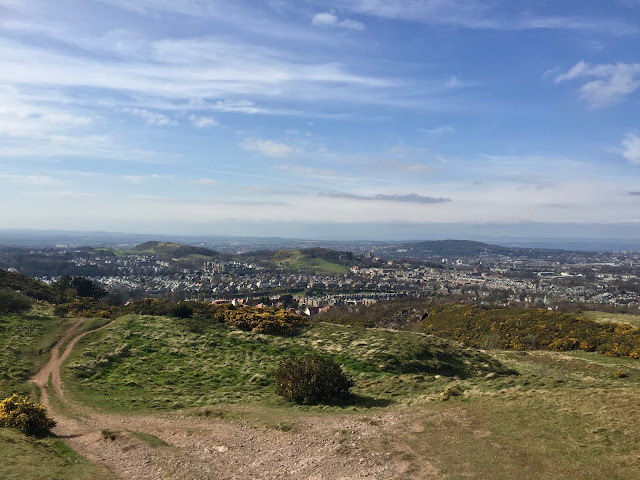 To my left, the Pentland Hills started to appear in the distance, marking the southern edge of Edinburgh (they are not one of the seven), and much larger than anything else nearby. The path wound through valleys in the undulations of the hill, passing by pylons as well, before opening up to the best viewpoint of the whole walk. 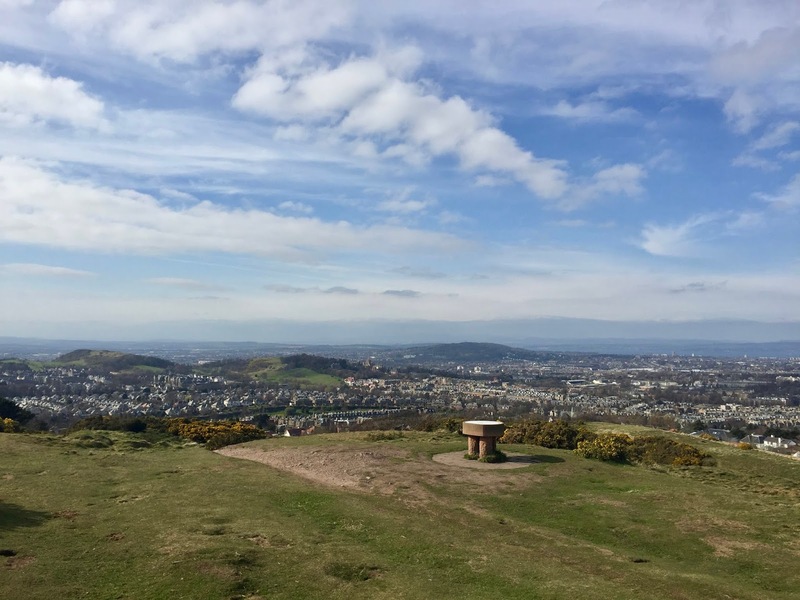 This is the highest point of the hill, and you can see in all directions around the city. There's lots of open, flat space here to stop for a while - certainly would be a great picnic spot, on a less windy day perhaps. The standing stone table is actually a sign, containing information about the city's geology, of how the hills were formed, and the other six of the 'Seven Hills' are all visible from here. They are highlighted on the sign, along with other significant landmarks visible. 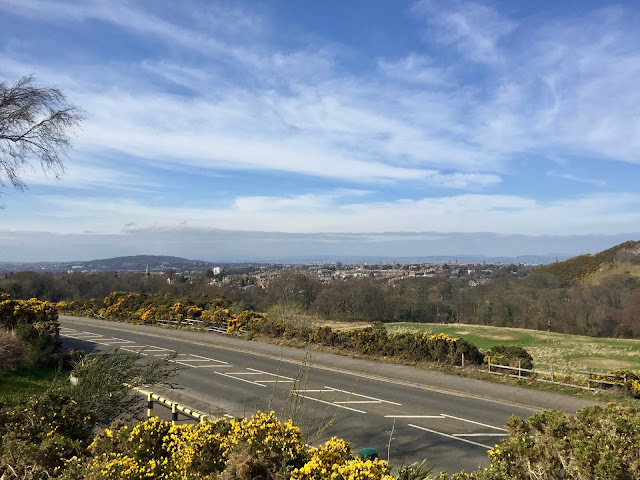 It was such a clear day that I could see the Queensferry Crossings in the distance, spanning the Firth of Forth, and glimpses of Fife beyond. Behind me were the Pentland Hills again, and I could spot recognisable buildings - especially church spires, we have hundreds of those! - all over the city. Definitely a great place to soak in the views for a while! Eventually, I continued on the path again, following a steep descent through the rockiest section I'd encountered all day. It wasn't a huge distance to go down, but it did make me glad I'd done this clockwise instead of the other way, to go down this instead of up it! After that, I could have turned right and completed the last little part of the loop to return to where I'd started, but instead I carried on left to come out on a road of houses again, just a couple of streets over from a bus stop to take me back home again. As far as hikes go, this was probably more of just a walk, being so level, and definitely one of the easiest I've done in Edinburgh. But with those stunning views over the city, it's absolutely worth checking out, and I'm sure I'll be back again some point!